One songbird is illegally trapped or killed every four seconds to provide residents of Cyprus with ingredients for a dish called ambelopoulia, according to Wildlife Extra. 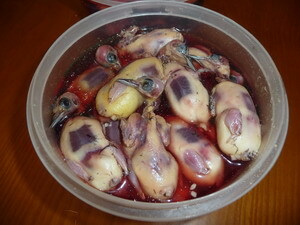 Quoting Tim Stowe, the Royal Society for the Protection of Bird’s (RSPB) international director, the online wildlife news publication reports that this mass slaughter takes place twice every year despite European, Cypriot, and Sovereign Base Area law that prohibits either trapping or killing wild birds. Often not far from popular tourist destinations, trappers use mist nets and lime sticks to catch mostly whitethroats and blackcaps. They then sell the birds to restaurants, where they are either boiled or pickled. Since the beginning of September, this fate has befallen more than one million songbirds on their annual migration between Europe and Africa. BirdLife Cyprus has been monitoring the situation in Cyprus since the annual bird-trapping season started in September. They are in the process of gathering signatures in order to pressure local ministers to step up their efforts to cull this banned practice. More than 11,000 people have already added their signatures to the petition. Ten days ago, Cyprus Mail reported that members of the anti-poaching unit of the Cypriot Police raided 13 homes throughout Aradippou, Maroni and Lefkara and arrested 6 people who had stored a total of 550 protected wild songbirds. Despite these important arrests, RSPB is concerned that if the local authorities don’t step up their anti-poaching enforcement program, especially to target restaurants that serve ambelopoulia, the number of songbirds that are plucked out the sky could reach epic proportions. The birds are taken from areas that are popular among tourists, including Ayia Napa, and inside UK-administered Sovereign Base Areas such as Dhekelia, according to WD. BirdLife Cyprus stresses that non-selective trapping on this scale – whereby hundreds of thousands of bird species that are not good for pickling also get caught in the nets – is “ecologically disastrous” and needs to be addressed urgently. One Vulture’s Tagged Migration or Zionist Plot? Go to southern Lebanon where everything with feathers is edible. Lime sticks are readily available in the West Bank markets including Hebron, they are illegal but no one seems to care. I really don’t see why any special horror or disgust should be reserved for this food practice which is essentially the same as killing and eating any other animal. I tend to agree with the guy from Cyprus that it is an indication of locals’ appreciation of available seasonal foods that drives this trend. The fact that they are supposed to be protected from such hunting: Ok, fine. But then just add them to the lot with all the other animals that are routinely poached. I sense a high degree of cultural condescension in this post. Typically, I just shake my head at people on these comment boards, but with this set of comments, I can’t just sit back and watch the ignorace. This has absolutely nothing to do with culture. How does an animal’s CRUCIFIXION measure up to anything you are talking about? Why isn’t anyone speaking about the unethical torment these birds (our pollinators by the way) are being put through till they finally die of starvation or suffocation? The importance of this article is to show the horror of the massacre and the level it has been taken too. These animals are being hung by their wings and feet, waiting to die, just like a man that some of us read about in a book called The Bible. Seasonal… yea whatever! If that’s the case, figure out how to do it without torturing the bird through unethical practices- for instance, killing it BEFORE PUTTING IT THROUGH TORTURE. I don’t eat animals that have been tortured for our culinary arts or tasteless palates! I don’t think we should turn this into a debate of unethical cultural practices, nobody likes that conversation. Arg…that image is worth a thousand words, though you always manage to string yours together so thoughfully. Turkish vs Greek matters, because it seems to me the dish is contrary to muslim dietary practices. That potentially makes the Turkish part free of the poachers. However, that doesn’t mean the birds couldn’t be caught in the north and smuggled to the south if it’s lucrative enough, and police repression might just push the prices up enough to make it worth while. It’s worth looking into. Thanks for bringing up the point, Xoussef. Xoussef, thanks so much. That’s a very interesting point that I had not considered. There are no pheasants in Israel. Chucker partridges exist but they are now illegal to hunt. The only game most hunters who still have licenses go after now are wild boar (which cause some damage to agriculture) and a few species of migrating wild ducks. Pigeons and doves are also legal, but few hunters go after then. There are now around 2,500 licensed hunters in Israel, most of them being Druse and Arabs. In the future, hunters will be used for “wildlife control” when particular species need to be culled down, or when they cause considerable damage to crops and orchards, like the pigs do. Song birds are not legal game in Israel. They are game for feral cats, sadly. …but I still hear the bullets flying when the season for pheasant hunting starts. It may not be legal, but it is still going on in Israel. Agreed Aviva, although I think that Maurice is trying to suggest that the scale is somewhat different. Even so, my mother told me once when I stole a bit of money for candy that stealing is stealing — doesn’t matter if you steal $1 or $20. I feel the same way about killing animals. Hunting for sport is on its way out in Israel and no new hunting permits are being issued. But even when hunting was still considered to be a sport, nothing like this ever occurred. In the video above they say about 10 million songbirds are killed every year. Cyprus is part of the EU. Why is this allowed to go on? Other countries spend money building wildlife sanctuaries and the Cypriots just catch the wild birds on glue traps to sell to tourists. Crazy. It’s in the Greek side but doesn’t actually matter where. It’s still going on. I must say though, the numbers are really exaggerated. There may be a million birds migrating but only a small number would be caught. I’m from Cyprus and believe me, it’s not that common to have these in tavernas. Cypriots prefer to eat seasonal foods which are fresh and have been doing so for thousands of years. True, although I don’t really see the value in making this political, which I fear such a distinction could cause, no? is this in Greek Cyprus, Turkish Cyprus, or both? might be important to qualify!